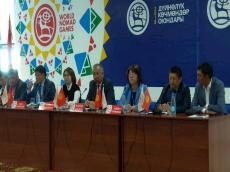 A press conference on results of World Nomad Games has been held in Kyrgyzstan. First Deputy Prime Minister of the Kyrgyz Republic Kubatbek Boronov, deputy Prime Minister of the Kyrgyz Republic Altynay Omurbekova, director of the State Agency for Youth, Physical Culture and Sports under the Government of the Kyrgyz Republic Kanat Amankulov, chief director of the III WNG Altynbek Maksutov, deputy Minister of Culture, Information and Tourism of the Kyrgyz Republic Ainura Temirbekova attended the conference. Kyrgyzstan accepts World Nomad Games for the third time. Previous competitions took place in 2014 and 2016. As for the fourth games, the place of their holding will be Turkey. This decision was made at a meeting of the Supreme Council of the strategic partnership between Bishkek and Ankara. Turkish President Recep Erdogan, Kazakhstan's leader Nursultan Nazarbaev, Hungary's Prime Minister Viktor Orban along with other distinguished delegations attended the opening ceremony which was hosted by the race track with 10,000 people capacity.